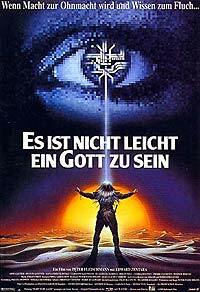 Es ist nicht leicht ein Gott zu sein (1989) - Sci-fi-central.com. West Germany / France / Soviet Union / Switzerland  1989  119m   Directed by: Peter Fleischmann.  Starring: Edward Zentara, Aleksandr Filippenko, Hugues Quester, Anne Gautier, Christine Kaufmann, Andrei Boltnev, Pierre Clémenti, Mikhail Gluzskiy, Elguja Burduli, Birgit Doll, Werner Herzog, Regimantas Adomaitis, Werner Hess.  Music by: Jürgen Fritz. A great European movie, nothing like the Hollywood stereotypes. A few years after the cold war made by people from France and west-Germany and the new Russia. So it has some kind of "pilot character" and is charming. The very famous Strugatzky brothers, well known for their inspiration for "Stalker" by A. Tarkovsky, wrote the book to this movie. (Of course the book is even better). Post-modern people, with possibilities like God confronted with the dark-ages and the moral fight, better than ever seen in Star Trek, that's the stuff the film made with. Just look it and enjoy it, it's far away from main stream. 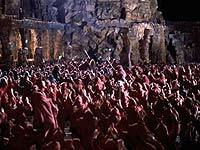 Warning: in the uncut version is more blood and violence than usual for an European movie and even more than a "Schwarzenegger-stealed" watcher would expect. Review by HodRuZ from Cologne, Germany from the Internet Movie Database.